Roofing is a complex science as well as an art. A proactive maintenance program in place can provide an average roof life of 21 years compared to 13 years with a reactive maintenance program, depending on the roofing system and building type. An effective roof management program is a win-win situation. The owner gets a trouble-free and cost-effective preventative program. With a proactive maintenance schedule in place, the average life-cycle cost is 14 cents per square foot. The average reactive maintenance life-style costs are 25 cents per square foot. Clean roof of all debris. Clean out all scuppers and drains. Seal and top off all pitch pans to avoid buildup of water. Check base and curb flashings for voids. Address all joints in metal perimeter coping. Aluminum coat all base and curb flashings. 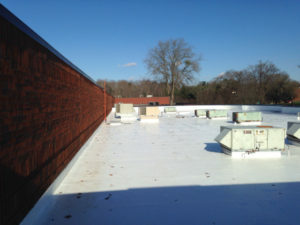 Identify deteriorations and/or damages to roof membrane. Address and caulk all joints in metal counter flashings. Identify roof damages from other trades. All damages or concerns found to be outside this scope of work will be documented and put into proposal form for the property manager’s consideration. Notify and update current roof system manufacturer of any/all changes to roof system as per warranty requirements.